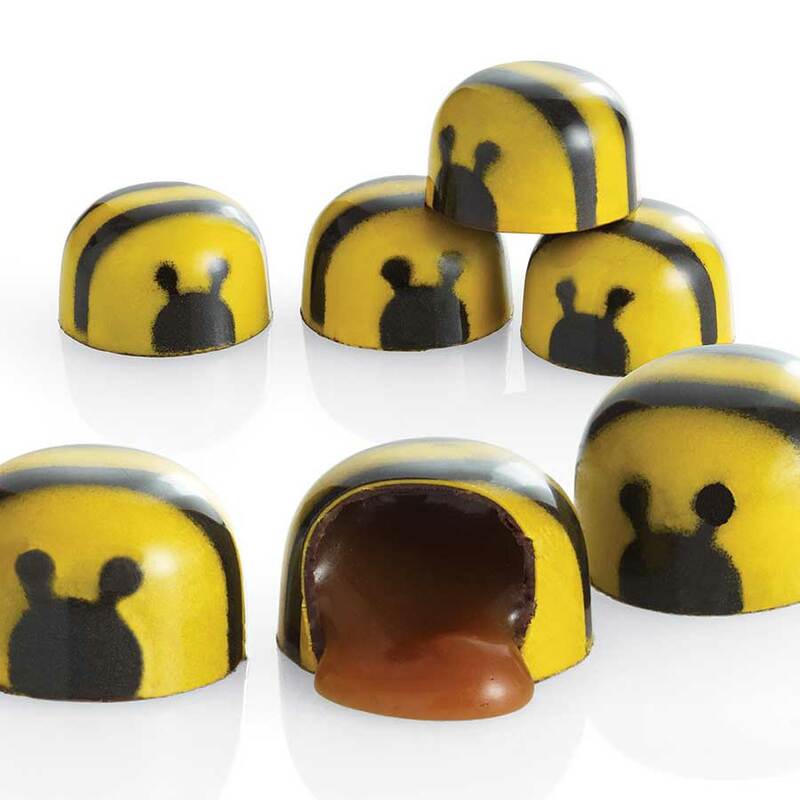 Each Chocolate Honey Caramel Bee seems to be adored by just about everyone that happens to be lucky enough to receive one as a gift. Not chewy like a store bought caramel, our Chocolate Honey Caramel Bees have a liquid caramel center and a clear, caramelized honey taste. This unique flavor comes naturally from the fragrant basswood honey we use, supplied by the Draper Family Apiaries in Millerton, PA. Once filled, each of the five bees is carefully painted by hand with a paper-thin layer of yellow and black cocoa butter. Guaranteed to please the palate just as much as the eye. Thank you for keeping your hives humming with your bee-utiful bees and other whimsical offerings! You bring joy across the internet with your honeylicious treats!. 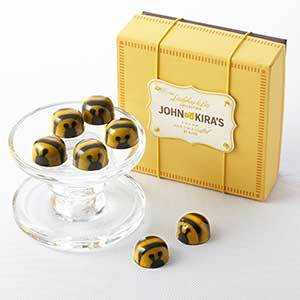 I love John & Kira's Bees! These honey bees are amazing. I ordered them in fall, and our family fell in love with them. They are the perfect blend of sweet and salty. One taste of these...and they will leave you wishing you had ordered more! These taste unlike any other chocolate I've had. The texture is amazing and unexpected. I often buy these as gifts and people always rave about them. From the packaging and presentation to the chocolate itself, it's truly a luxurious indulgence. 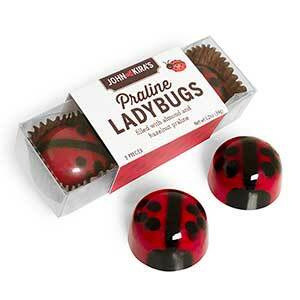 We were first introduced to these little morsels of delight as a gift. 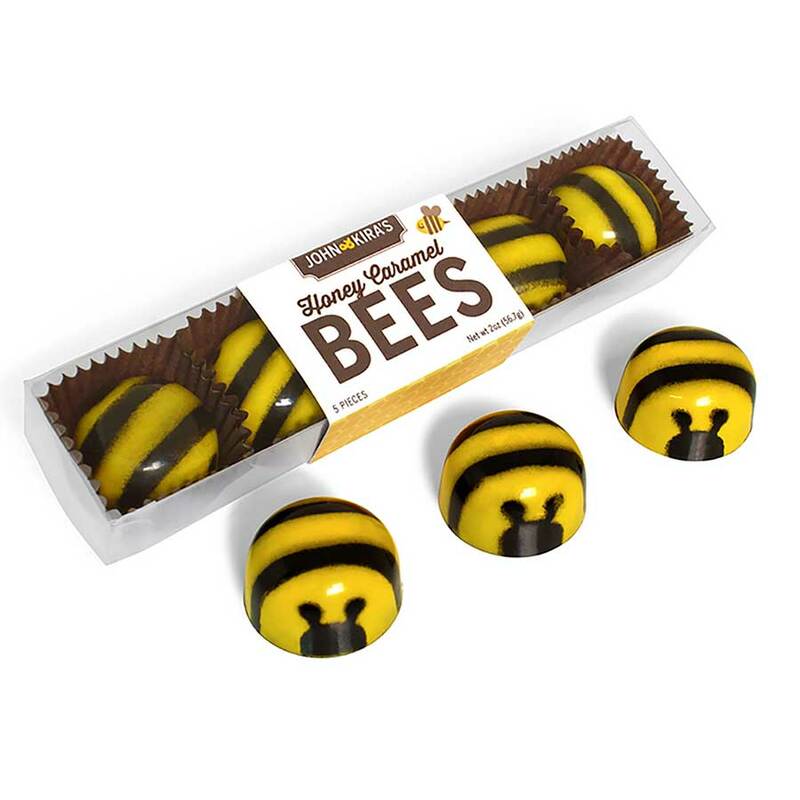 The chocolate is wonderful and the honey bursts in your mouth (or runs down your chin) to compliment the flavor perfectly. There is a good reason they are J&K's signature sweet. Our only criticism is the high shipping cost to California. We don't mind paying a fairly high price for the chocolates but the shipping simply puts them out of reach except for rare occasions. (The occasional 'free shipping' isn't. You have to spend a LOT to qualify.) Still love your products! Owner Response: Glad you enjoy our Bees! We know shipping can be a drag, but our $12.95 shipping price is the cost of keeping everything safe in transit, no matter the weather, so that it arrives at your door as perfectly as when it leaves ours. Our Bees are one of the products available to select retail locations, however, so in California if you find yourself craving sweets in between those rare occasions, you can find our Bees at Chocolate Covered in San Francisco and Sugar Rush Sweet Shop in Irvine, CA. These are by far the best caramels we've ever had. It's rare to eat something that tastes exactly as the name would suggest. 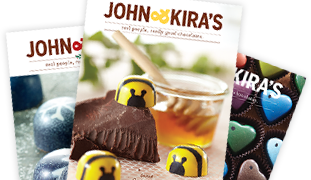 All of John&Kira's chocolates are like this. When you hear honey, you taste HONEY. When you hear fig, you taste FIG. We give these as gifts all the time and always buy for ourselves while we're at it! Beautiful to look at; impossible to resist! I love these bees! They are the perfect combination of contrasts--sweet and salty; smooth and hard on the outside with a center that is delectably creamy and filled with silky liquid . These are now my favorite candy. Their addictive quality is only tempered by the fact that they look to beautiful to eat! 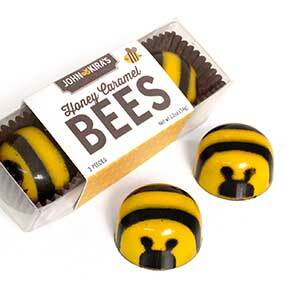 These are the bees knees!!! I have given these little guys as gifts for Mother's Day and birthdays, and they are so dang delicious (I required my mom to let me taste one, couldn't resist). The caramel is on the runnier side, not stiff like some "boxed" chocolates. These are such a crowd-pleaser, and are so cute too! Yummy and a great gift! 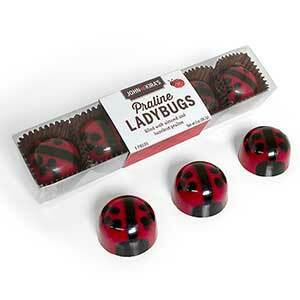 The melt-in-your-mouth gooey deliciousness that is these chocolates make for a perfect gift. The caramel is just the right texture and each bite sparks joy. This is a go-to gift. I love giving these chocolates as a host gift, but also make a great little something extra for someone. I definitely recommend these chocolates. The Bee's are a staple when it comes to sending a little "Thank you" to our team! These one bite treats are satisfying and cute enough to make anyone smile. Highly recommended!